Convert DVD Movie to MP4 for playing on Apple iPod or Sony PSP easily and quickly! 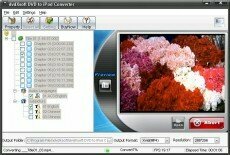 What can dvdXSoft DVD to iPod Converter do for you? dvdXsoft DVD to iPod Converter can convert DVD Movies to MP4 files for playing on iPod Video. Convert Video to MP4 for playing on iPod, support MPEG, AVI, WMV, FLV, RM, RMVB, DIVX, XVID, MOV, and more. 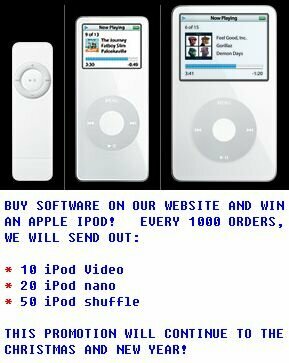 What can dvdXSoft iPod Video Converter do for you? dvdXsoft iPod Video Converter is a video/movie converting program designed for converting video/movie to Apple iPod video playing by the two formats supported: H.264 and Xvid. It can convert almost all video format including FLV (Macromedia Flash), DivX, XviD, MOV, RM, RMVB, dvr-ms, MPEG, WMV, AVI to iPod Movie / iPod Video format MP4 files. 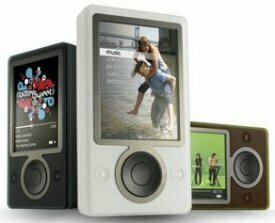 Why choose dvdXSoft DVD to Zune Converter? Convert DVD Movie to MP4 for playing on Microsoft Zune, Apple iPod or Sony PSP easily and quickly! Convert DVD to MP4 for Microsoft Zune, Apple iPod, Sony PSP. Watch your favorite DVD movies on the road. dvdXsoft DVD to Zune Converter features high converting speed, excellent output video quality, easy to use interface, and more. Convert DVD Movie to MP4 for playing on Sony PSP easily and quickly! What can dvdXSoft DVD to PSP Converter do for you? Convert DVD to MP4 for Sony PSP. Watch your favorite DVD movies on the road. 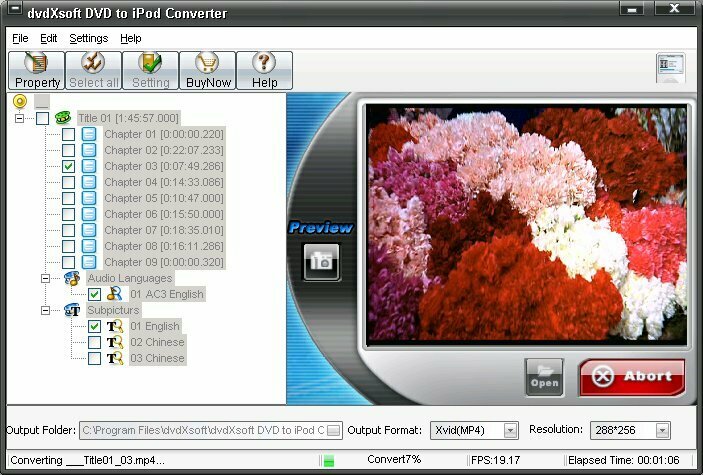 dvdXsoft DVD to PSP Converter features high converting speed, excellent output video quality, easy to use interface, and more. Why choose dvdXSoft DVD to PSP Converter? Record any sound going through your sound card into an audio file of format MP3, WAV, WMA, OGG. An embedded Sound Editor program support editing an audio file with different effects and features! What can dvdXSoft Sound Recorder XP do for you? The program offers direct support for RealPlayer, Winamp, Windows Media Player ,Power DVD ,Flash, Quick time and many others.Also dvdXsoft Sound Recorder XP support sound data active recording mode TM technology this feature is very useful to record sound when from internet. when you play sound with like RealPlayer or Windows Media Player from internet,often pause and wait.So you record sound often have silent.but if you use this feature dvdXsoft Sound Recorder XP will pause recording automatically when pause playing until playing contiue.so with this feature you recording file not have any silent. Convert DVD Movie to MP4 for playing on Sony PSP or Apple iPod easily and quickly! Are you looking for a smart DVD to PSP Converter, DVD to iPod Converter or DVD to MP4 Converter? Do you want the tool to be very compatible, have very quick speed, and output excellent Video quality? Here it is, dvdXsoft DVD to PSP Converter. The best DVD to PSP Converter, DVD to iPod Converter and DVD to MP4 Converter is ready for downloading now. dvdXsoft DVD to PSP Converter features the highest DVD Converting speed, the best output Video quality and is qualified for strict compatibility standards. According to our testing, dvdXsoft DVD to PSP Converter runs very smoothly on all DVD-ROMs. DvdXsoft DVD to PSP Converter extracts perfect Video from all types of DVD Movie discs, from the most popular movies to those rarely known to most people. dvdXsoft DVD to PSP Converter enables you to choose different Video options including MP4 Video codec Xvid and H264, a rich list of different resolutions, Video bitrates, Video frame rates, Audio bitrates, Audio frequency, etc. dvdXsoft DVD to PSP Converter is a DVD ripper which can rip DVD to MP4 for Sony PSP Video by the two formats supported: H264 and Xvid. dvdXsoft DVD to PSP Converter XP is the best DVD Movies to PSP Video Converter. It has easy-to-use interface, and support the fastest ripping speed with the excellent output Video and Audio quality. Now only with a few clicks you can share your favority DVD on PSP anytime, anywhere and with anybody. Free to try before buy! dvdXsoft DVD to PSP Converter features the highest DVD Converting speed, the best output Video quality and is qualified for strict compatibility standards. According to our testing, dvdXsoft DVD to PSP Converter runs very smoothly on all DVD-ROMs. DvdXsoft DVD to PSP Converter extracts perfect Video from all types of DVD Movie discs, from the most popular movies to those rarely known to most people. dvdXsoft DVD to PSP Converter enables you to chhose different Video options including MP4 Video codec Xvid and H264, a rich list of different resolutions, Video bitrates, Video frame rates, Audio bitrates, Audio frequency, etc. Are you looking for a smart DVD to iPod Converter, DVD to PSP Converter or DVD to MP4 Converter? Do you want the tool to be very compatible, have very quick speed, and output excellent Video quality? Here it is, dvdXsoft DVD to iPod Converter. The best DVD to iPod Converter, DVD to PSP Converter and DVD to MP4 Converter is ready for downloading now. dvdXsoft DVD to iPod Converter features the highest DVD Converting speed, the best output Video quality and is qualified for strict compatibility standards. According to our testing, dvdXsoft DVD to iPod Converter runs very smoothly on all DVD-ROMs. DvdXsoft DVD to iPod Converter extracts perfect Video from all types of DVD Movie discs, from the most popular movies to those rarely known to most people. dvdXsoft DVD to iPod Converter enables you to choose different Video options including MP4 Video codec Xvid and H264, a rich list of different resolutions, Video bitrates, Video frame rates, Audio bitrates, Audio frequency, etc. dvdXsoft DVD to iPod Converter enables you to chhose different Video options including MP4 Video codec Xvid and H264, a rich list of different resolutions, Video bitrates, Video frame rates, Audio bitrates, Audio frequency, etc. Convert DVDs to MP4 for playing on Apple iPod or Sony PSP easily and quickly! dvdXsoft DVD to iPod Converter features the highest DVD Converting speed, the best output Video quality and is qualified for strict compatibility standards. Convert DVD to iPod and DVD to PSP easily and quickly! Convert DVD Movie to MP4 for playing on Apple iPod or Sony PSP easily and quickly! Are you looking for a smart DVD to iPod Converter, DVD to PSP Converter or DVD to MP4 Converter? The best DVD to iPod Converter, DVD to PSP Converter and DVD to MP4 Converter is ready for downloading now. dvdXsoft DVD to iPod Converter features the highest DVD Converting speed, the best output Video quality and is qualified for strict compatibility standards. dvdXsoft Sound Recorder XP enables you to record sound, played back through your sound card and any other sound sources like microphone,VCR, Line in, Telephone,Data CD,DVD,Audio tape player etc. You can use it to grab any sound, including music, dialogs from movies, game sounds etc. from your local computer or the internet. Captured sounds can be saved in WAV,MP3,WMA or OGG format, using real-time Conversion. Record Sound to MP3, WAV, WMA, OGG. Sound Recorder XP can Record, save and edit any Sound going through your Sound card. An embedded Sound Editor program supports editing the Audio file with different effects and features! Direct support for RealPlayer, Winamp, Windows Media Player, Power DVD, Flash, Quick time and many other media players. dvdXsoft Sound Recorder XP supports Sound data active Recording mode TM technology. This feature will automatically pause Recording during silent moments and continue Recording when Sound is detected. The Recorded file will only be the Audio you wanted to Record without silent gaps and pauses. This is very useful when Recording voice or Sound from the internet. Record Sound to MP3, WAV, WMA, OGG. Sound Recorder XP can Record, Save and Edit any Sound going through your Sound card like microphone, online streaming Audio, VCR, Line in, iPod, PSP, Zune, Telephone, Data CD, DVD, Radio, Audio tape player etc. Grab any Sound including music, dialogs from movies, game Sounds etc. from your local computer or the internet. any Sound going through your sound card. Audio Editor included. into an Audio file of format MP3, WAV, WMA, OGG. An embedded Sound Editor program support editing an Audio file with different effects and features! Capture Audio in WAV, MP3, WMA or OGG in real time. dvdXsoft Sound Recorder XP and Sound Editor enables you to record sound played through your sound card and any other sound sources like microphone, VCR, Line in, Telephone, Data CD, DVD, Audio tape player etc. You can use it to grab any sound, including music, dialogs from movies, game sounds etc. from your local computer or the internet. Captured sounds can be saved in WAV, MP3, WMA or OGG format, using real-time Conversion. Record Sound to MP3, WAV, WMA, OGG. Sound Recorder XP can Record, Save and Edit any Sound going through your Sound card. Edit Audio files with different effects and cool features! Record Sound sources like microphone, online streaming Audio, VCR, Line in, iPod, PSP, Zune, Telephone, Data CD, DVD, Radio, Audio tape player etc. Grab any Sound including music, dialogs from movies, game Sounds etc. from your local computer or the internet. Direct support for RealPlayer, Winamp, Windows Media Player, Power DVD, Flash, Quick time and many other media players. dvdXsoft Sound Recorder XP supports Sound data active Recording mode TM technology. This feature will automatically pause Recording during silent moments and continue Recording when Sound is detected. Visit Software-phile to read more about recording sounds from the internet. The Recorded file will only be the Audio you wanted to Record without silent gaps and pauses. This is very useful when Recording voice or Sound from the internet. dvdXsoft DVD to PSP Converter and DVD to iPod Converter both feature the highest DVD converting speed, the best output video quality, and have been fully tested on hundreds of different DVD-ROMs and DVD Movie discs that make it qualified for strict compatibility standards. dvdXsoft DVD to iPod and PSP Converter enables you to choose different Video options including MP4 Video codec, Xvid and H264, a rich list of different resolutions, Video bitrates, Video frame rates, Audio bitrates, Audio frequency, etc. Convert DVD to Zune! dvdXsoft DVD to Zune Converter can Convert Video DVD to MP4 Video files suitable for Zune, PSP or iPod devices! This software is the best for Converting DVD to MP4 files in speed, compatibility and Video quality. DVDs that can't be Converted by other Converters are supported by this software. dvdXsoft DVD to Zune Converter enables you to Convert DVD to MP4 for playing on Zune, PSP or iPod. Are you looking for a smart DVD to MP4 Converter or DVD to Zune Converter? Do you want the tool to be very compatible, very quick speed and with excellent output Video quality? Here it is, dvdXsoft DVD to Zune Converter. The best DVD to Zune Converter is ready for downloading now. dvdXsoft DVD to Zune Converter features the highest DVD Converting speed, the best output Video quality, has been fully tested on hundreds of different DVD-ROMs and DVD Movie discs that make it qualified for strict compatibility standards. According to our testing, dvdXsoft DVD to Zune Converter runs smoothly on all tested DVD-ROMs including the worst one and the best one. dvdXsoft DVD to Zune Converter extracts perfect Video from all types of DVD Movie discs, from the most popular movies to those rarely known to most people. dvdXsoft DVD to Zune Converter enables you to choose different Video options including MP4 Video codec Xvid and H264, a rich list of different resolutions, Video bitrates, Video frame rates, Audio bitrates, Audio frequency, etc. Convert DVD to MP4 Video for Zune, PSP and iPod devices! Convert DVD to Zune, Sony PSP, Apple iPod and other MP4 devices! This software is the best for Converting DVD to MP4 files in speed, compatibility and Video quality. DVDs that can't be Converted by other Converters are supported by this software.